Prevent freezing and keep the pond temperature up over the hard winter period. Pond Heaters will help reduce many of the problems normally associated with Spring in the koi pond. 1” Female Thread - 22mm Brass Fitting. Need one in and one out of heat exchanger for flow of hot water to / from boiler. Cheaper to run than a heater, this unit simply circulates the water locally. The moving water keeps the pond surface free of ice in one area, so that the toxic fermentation gas can escape. 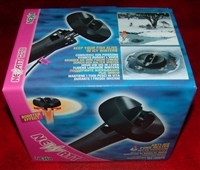 This floating pond heater is one of the most effective ways to keep an area of your pond ice free in winter. Through this ice free opening harmful gases can escape from the pond water. The floating heater is not designed to heat the whole pond, but to keep an area ice-free. It can stay in the pond, floating on the surface, or can be placed in the filter. Controller complete with probe - sends signal to open / close thermostatic valve on the heating system to control the pond temperature when using a Heat Exchanger. 1kW pond heater with stainless steel tube & tungsten element. Very easy to fit - uses standard 13A supply. Cut your hose (to filter) and insert the heater. For a small pond / treatment tank. 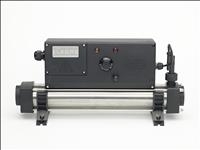 100,000btu stainless steel heat exchanger for heating a pond using your central heating system. Needs 2 brass fittings, a digistat and a thermostatic valve. Suitable for a small or indoor pond. 2kW pond heater with stainless steel tube & tungsten element. 130,000btu stainless steel heat exchanger for heating a pond using your central heating system. Suitable for a medium or indoor pond. 170,000btu stainless steel heat exchanger for heating a pond using your central heating system. 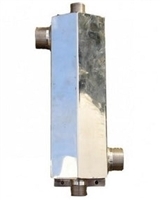 Larger heat exchangers are available on request. 3kW pond heater with stainless steel tube & tungsten element. For a small to medium pond. 2kW pond heater with stainless steel element & interior.